Trackbot Mobile Robot | ROBOTS IN SEARCH INC. This is the Trackbot Robotic Platform. 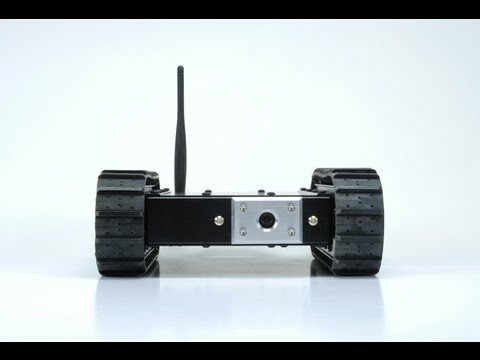 The Trackbot is a small, lightweight, affordable robot designed for surveillance, reconnaissance and inspection. The Trackbot is a tracked platform with a fixed front facing camera, a lightweight shell and the ability to turn on a dime. It is designed for multiple applications such as Education, Engineering, Security and Remote Inspection. Electric vehicle with high-torque gearing and motor and rechargeable batteries. You can charge the Trackbot in the field with your own vehicles’ 12 volt battery. The Trackbot is perfect for confined spaces or remote operations. It is Lightweight Under 10 Lbs! Completely Mobile- No AC required. This is a stable and reliable system. It includes a low lux Camera. With its high powered transmitter and receiver you can now see where you can’t see! Low Profile - Perfect for Under Vehicle Inspection.